Beetroot is a very healthy vegetable. Research has found that beetroot helps reduce blood pressure to a great degree if consumed daily. In my family, my mother is suffering from high pressure and hence she has been advised by the doctors to include beetroots in her regular diet. The below recipe of beetroot is an interesting one. Served with steamed rice, it tastes amazing. Hope you guys will like it. 1) Peel the beetroots and then boil them in microwave or stove top. If using microwave, then boil it for 20 minutes and if using, stove top, boil it at least for half an hour till the beetroots appear soft to the touch. 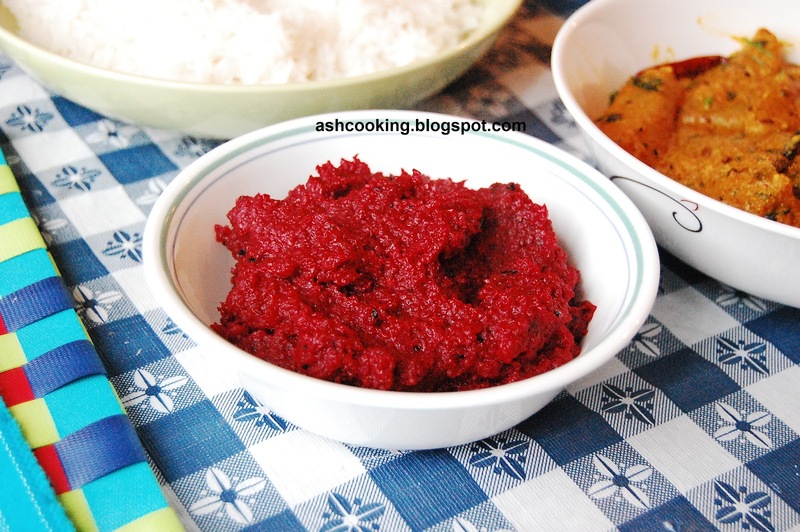 2) Now in a food processor, grind together beetroot and green chillies into fine paste. Mix in mustard paste and poppy paste with the beetroot. 3) Heat oil in a non-stick skillet and as oil turns hot, toss in nigella seeds and wait till they crackle. 4) Add the beetroot paste and stir up till beetroot becomes dry.